In this second tutorial, we’ll explain a more complete application in order to deepen the development with Phalcon. INVO is one of the applications we have created as samples. 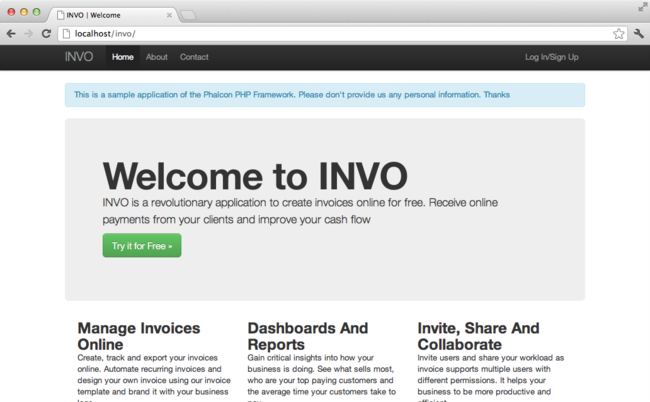 INVO is a small website that allows their users to generate invoices, and do other tasks such as manage their customers and products. You can clone its code from Github. 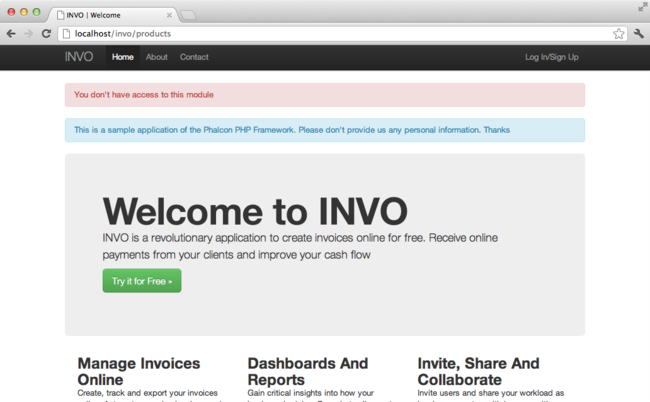 Also, INVO was made with Bootstrap as client-side framework. Although the application does not generate invoices, it still serves as an example to understand how the framework works. As you know, Phalcon does not impose a particular file structure for application development. This project provides a simple MVC structure and a public document root. The application is divided into two parts, a frontend, that is a public part where visitors can receive information about INVO and request contact information. The second part is the backend, an administrative area where a registered user can manage his/her products and customers. INVO uses the standard route that is built-in with the Router component. These routes match the following pattern: /:controller/:action/:params. This means that the first part of a URI is the controller, the second the action and the rest are the parameters. Phalcon hasn’t any pre-defined convention settings. Sections help us to organize the options as appropriate. In this file there are three sections to be used later. The second part that appears in the bootstrap file (public/index.php) is the autoloader. The autoloader registers a set of directories in which the application will look for the classes that it eventually will need. Note that the above code has registered the directories that were defined in the configuration file. The only directory that is not registered is the viewsDir, because it contains HTML + PHP files but no classes. Look at the first line of the code block above, the Application class constructor is receiving the variable $di as an argument. What is the purpose of that variable? Phalcon is a highly decoupled framework, so we need a component that acts as glue to make everything work together. That component is Phalcon\DI. It is a service container that also performs dependency injection, instantiating all components as they are needed by the application. There are many ways of registering services in the container. In INVO, most services have been registered using anonymous functions. Thanks to this, the objects are instantiated in a lazy way, reducing the resources needed by the application. Here, we have the freedom to change the adapter, perform additional initialization and much more. Note that the service was registered using the name “session”. This is a convention that will allow the framework to identify the active service in the services container. It registers the majority of services with components provided by the framework as standard. If we need to override the definition of some service we could just set it again as we did above with “session”. This is the reason for the existence of the variable $di. For simplicity, we have used “sha1” to store the password hashes in the database, however, this algorithm is not recommended in real applications, use “bcrypt” instead. Note that multiple public attributes are accessed in the controller like: $this->flash, $this->request or $this->session. These are services defined in the services container from earlier. When they’re accessed the first time, they are injected as part of the controller. These services are shared, which means that we are always accessing the same instance regardless of the place where we invoke them. All the UI elements and visual style of the application has been achieved mostly through Bootstrap. Some elements, such as the navigation bar changes according to the state of the application. For example, in the upper right corner, the link “Log in / Sign Up” changes to “Log out” if an user is logged into the application. This part of the application is implemented in the component “Elements” (app/library/Elements.php). * Execute the "search" based on the criteria sent from the "index"
Note that $productTypes contains the data necessary to fill the SELECT tag using Phalcon\Tag::select. Once the form is submitted, the action “search” is executed in the controller performing the search based on the data entered by the user. If the field data type is text or similar (char, varchar, text, etc.) It uses an SQL “like” operator to filter the results. If the data type is not text or similar, it’ll use the operator “=”. Additionally, “Criteria” ignores all the $_POST variables that do not match any field in the table. Values are automatically escaped using “bound parameters”. A session bag, is a special attribute in a controller that persists between requests. When accessed, this attribute injects a Phalcon\Session\Bag service that is independent in each controller. Now let’s see how the CRUD creates and updates records. From the “new” and “edit” views the data entered by the user are sent to the actions “create” and “save” that perform actions of “creating” and “updating” products respectively. Data is filtered before being assigned to the object. This filtering is optional, the ORM escapes the input data and performs additional casting according to the column types. This tutorial covers many more aspects of building applications with Phalcon, hope you have served to learn more and get more out of the framework.